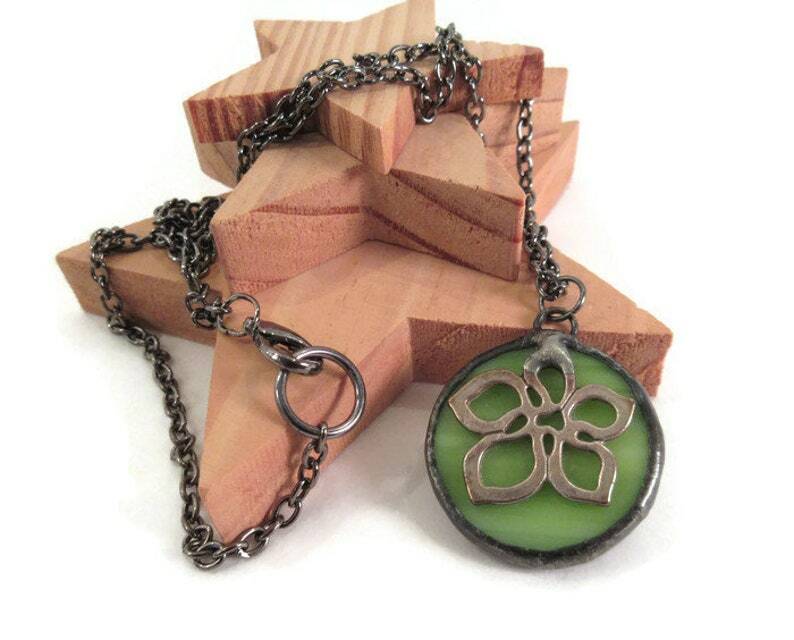 Lime Green round Flower pendant is a handmade necklace crafted in stained glass. This Green necklace is one of the smaller necklaces in my collection. It measures just 1 x 1 inches or 2.5 x 2.5 cm. and is hung on a smaller silver coloured chain with lobster clasp. The small green glass circle has been embellished with a small flower charm that has been soldered on. The glass circle is edged in copper foil and given a generous layer of lead free solder, a dark patina is applied and then the piece is waxed and polished to a shine. This small round pendant comes packaged in a handmade fleece gift bag that is ready for gift giving or safe keeping.